How to apply: While you can't cover up puffiness, Dedivanovic says there is a trick you can do with concealer to make it less noticeable. Mix a liquid concealer with a tiny bit of highlighter, and dab it where you're puffy. Then blend the highlighter into your crease, which will help reflect light and give the effect of smooth skin. We recommend E.L.F. 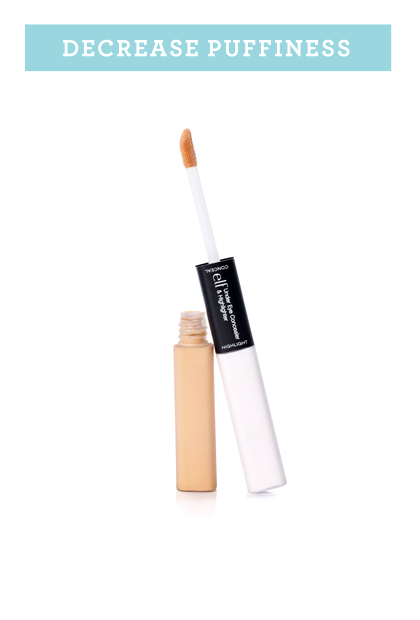 Studio Under Eye Concealer & Highlighter, $3. i have so much to learn! and need to shop for a couple of other concealers as well. i have a creamy pencil and a powder, time to get the liquid and the blender sponge. I will be buying a concealer pencil for my spider veins! Thanks! I have dark circles usually and some acne scars. I absolutely loved the idea of running a sponge under water, squeezing the water out, dipping into loose powder, then dabbing over the area to set the concealer. I am totally going to try this out. Great information. One formula for concealer doesn't cut it for multiple issues. Neither is just one technique. So glad to see that represented here.